Akihabara is a premium Magento theme that is specially designed for online stores selling digital cameras and related accessories. A formal design scheme and crisp layout make the theme in tune with your products. The theme is built on the 960.Grid System layout design that allows a greater degree of customization within your pages. The theme is cross-browser compatible and is designed for Magento community edition 1.4.2 and higher. An attractive boxed layout with a glossy black and gray color scheme makes the theme design in tune with your products. The homepage has an integrated slider which can be used for your featured images, new products, deals, promotional banners etc. The rest of the layout comes in a default 3 column boxed product grid for your featured products. The theme allows you to upload a custom logo and also set a default greeting message for your users. An opt-in box in the footer helps your users subscribe to your email newsletter mailing list. The header comes with a primary multi-level menu for different product categories. A separate top menu has account management links. You can also add internal quicklinks in the footer space, and can have “Shop By” category groupings such as price ranges, color, range etc in internal pages. A keyword search box allows users to do a quick keyword search for a desired product. An advanced search facility allows users to search with multiple product attributes such as size, manufacturer etc. Users can also track the status of their orders from their account dashboard. Internal product pages come with support for multiple images along with an embedded Lightbox gallery with magnification and auto-shuffling effects. A tabbed content extension helps you include multiple product content descriptions within the same space. Users can easily switch between different tabs without having to navigate through whole of the page to find the desired content. Users can also submit reviews along with starred ratings. They can also create a wishlist of products from their dashboard and can also compare between multiple products. The theme also has a “Contact Us” page with a built-in message form as well as an “About Us” page where you can add a brief description about your site. The Magento Admin panel helps in easy design customization and allows you manage your inventory, payments, order etc from an easy to use interface. 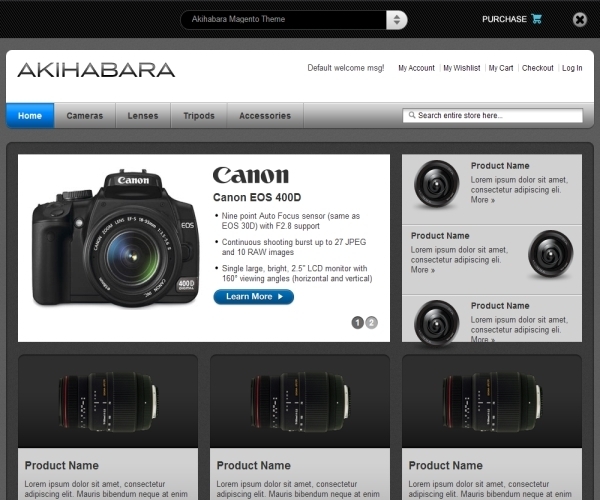 The Akihabara premium Magento theme for online camera stores is priced at $85.